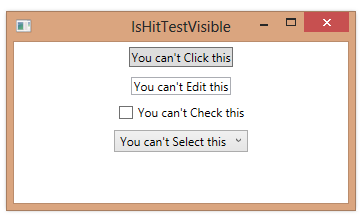 When you set the IsHitTestVisible property to false for a user interface element, it will no longer respond to mouse input and will not fire mouse-related events. 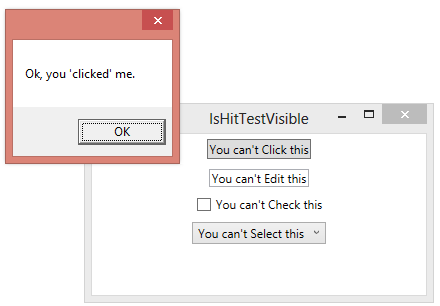 With IsHitTestVisible set to false, you therefore can’t use the mouse to interact with a user interface element at all. In the example below, we can’t use the mouse to give the elements focus or to click or select any of them. <Button Content="You can't Click this" HorizontalAlignment="Center" Margin="5" Click="Button_Click_1"
<TextBox Text="You can't Edit this" HorizontalAlignment="Center" Margin="5"
<CheckBox Content="You can't Check this" HorizontalAlignment="Center" Margin="5"
Notice, however, that you can still interact with the elements using the keyboard. For example, you can tab to the Button and then press Enter to trigger its Click event.